The focus on this update has been on making the new example sentence database more flexible allowing you to dive down infinite levels - like brainstorming. It’s pretty amazing. 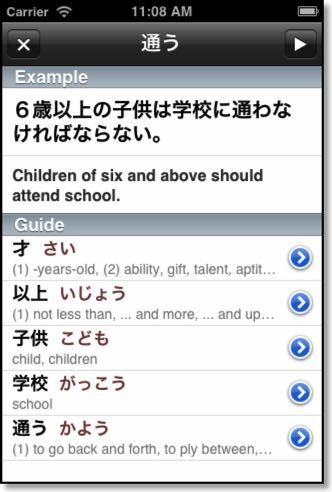 There’s also a new “Add To Deck” button that saves the current word/kanji and allows you to build a deck without ever touching a keyboard. ☃ Example sentence section completely rewritten. ☃ Vocabulary is broken down into kanji. ☃ Allows the studying of a perfected deck. ☃ Delete button in “1 sticky” display. ☃ Fixed the stats backup with Dropbox. ☃ Sort->”Rand” can be pressed twice in a row. ☃ Set your browse settings for ALL files with one button. ☃ New icons, all bugs fixed (that I’ve been told of) and TLC. Aiming for a late February release, wife/work permitting.